What to know before you SEW! I have been asked by people "What do I need to start sewing?" Sewing is much like anything else, it takes money and depending on what you wish to do, that can be a huge amount of money but to start it does not have to be a bank account draining proposition. Having not started sewing life until I was in my 40's, after my fourth child was born, I had nothing...no stash...no fancy machine and really not even a place to call my own. I was on bed rest for 12 weeks and the internet became my best friend. I found people doing this CRAZY thing called sewing. I looked at all of the beautiful creations they were making but it was not until after Adam was born I decided that I needed to take that plunge...that I COULD sew but what did I NEED to sew? I have been thinking about this question quite a lot the past week while trying to make my sewing space one that I love and wonder if there are things I would have told the beginning sewer me years ago. Without guidance and with little budget to start sewing, I did start from scratch. Here are some of the things I have learned along the way and hope they will help you if you are wanting to start sewing but are unsure how to make the plunge. "How much is a sewing machine?" or "What should I buy?" When our second son would ask how much is a car, the answer would be, "It depends." This rule applies to sewing machines completely. Sewing machines have a HUGE range of prices and features. You might be lucky enough to get one for FREE or you can spend $10 on a vintage one or $11,000 on the newest, latest and greatest. Realistically, most sewers will never ever ever use all ( or even a quarter) of the features that are included on most of the newer machines but boy they look nice. In my book, there is nothing more valuable than a dependable simple straight stitch sewing machine. Another low cost option is buying used. I happen to have a weakness for vintage machines. I love finding older machines for their history, beauty and gosh darn it...vintage is FUN! One of the best machines I have in my home is a Singer 301. I LOVE this machine and it only does one thing...straight stitch! It makes the most beautiful straight stitches ever. It was found on Craigslist for $25. The Goodwill and other thrift shops also have wonderful choices. I found a great Kenmore sewing machine for my daughter-in-law for $24 and she has been sewing with it now for a few years. It has a few more stitches than my Singer and is not the prettiest girl at the dance but I would choose her over 90% of the brand new off the shelf machines offered today! So check out your local thrifts, craigslist, ebay and garage sales to see if this might be a good option for you. A word of caution...when buying vintage make sure that the wires are good! Also, if you buy without any background information that will give you insight into the care and regular cleanings of the machine, take your machine to a shop to have it cleaned and oiled. If you find a machine with no manual, use can usually find them online for free or at a nominal fee. Vintage machines will last you a LIFETIME if cared for properly. If you like bells and whistles and the sky is the limit...GO FOR IT! I love my Bernina! I have been sewing on a Bernina for seven years. My first Bernina ( a 1005) was a trade in that I purchased for a Sew and Vac and the second is my Bernina 440QE that I adore. To start out you will not need much or anything super high quality. Plan on ripping out stitches and making mistakes cutting. This is a normal part of the process :o) I still do both of those things regularly. Again, ask around, there may be someone in you family or a friend that would be more than HAPPY to thin out some of those " why did I buy this " fabrics and it will not cost you a penny! Joann Fabrics has really great sales and is a good starting off point when starting your sewing. Looking back, I wish I had bought all solid colors in the beginning. There are SO MANY cute prints but you can only do so much with them. The possibilities for solid fabrics are endless! You can also buy precut fabrics if you want to start sewing without a bunch of cutting first! Reputable online shops often have sales around the holidays, for special occasions and there are always the clearance or end of bolt sales! I have an OLFA rotary cutter. This one is the 45mm Splash that can be found on sale for as low as $12! I have more than one and favor a tiny one that came with a vintage machine, I love it so much I have named it Jack! These are inexpensive and can be found just about anywhere that sells sewing items. Learn to love this item and you may want to get two since they are small and tend to get lost ( at least in my sewing room ). I have numerous pairs of scissors but to start, I had a pair of Fiskers. My go to scissors are my FAVORITE pair which is by Famore Cutlery and are the most wonderful things ever and this little pair of Fiskers. I always and will always use Aurifil! The quality and value is the best! It may seem as though it is an expensive thread but yard for yard it is one of the best economical threads available. There is also no lint from this thread which will help your machine last longer! Look for a sale! Fat Quarter Shop has incredible sales frequently and so does Craftsy( there is a ale going on NOW)! If you will be making a quilting project, start out with 50wt. I recommend color 2600. It is a light gray that blends with just about EVERYTHING! 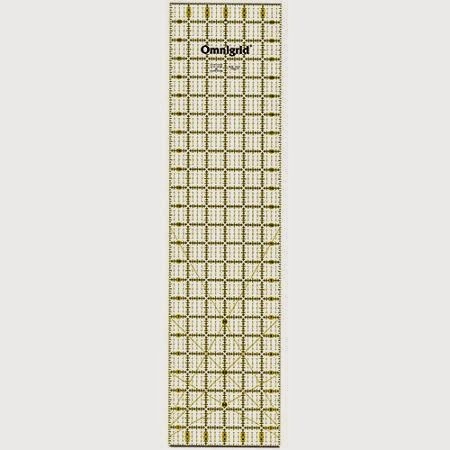 I use and Omnigrid Quilter's Ruler 6"x24". This one can be found at online at Joann Fabrics for less than $12 right now! I have an OLFA cutting mat. A cutting mat can be spendy for the larger 36x24. This is another item that you can buy at Joann Fabrics and make sure to use your 50% off coupon! Or opt to start smaller. The 12x18 is on sale right now at Joanns for $13.79! GREAT starter mat! I use the ones with the flowers on the top. I forget to remove my pins when sewing sometimes and so the colors are a good reminder for me to move them and the flat head makes it easier to move. 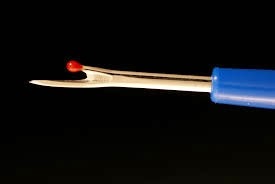 I prefer the Bohin pins ( and hand sewing needles too). You can find these at your local quilt shop ( I love Kelly Ann's Quilting) or on Amazon if you are not close to a LQS. You can purchase Schmetz EVERYWHERE!! 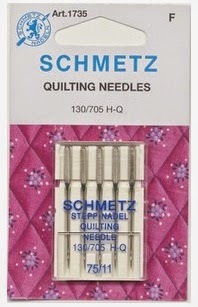 I stared with Quilting needles sized 75/11. 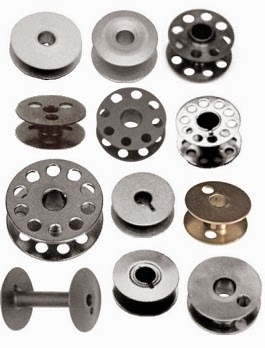 Make sure to find out what type of bobbins your machine uses and purchase a few more. Bobbins are not a universal item so what fits into my Singer will not fit into my Bernina! You can use whatever iron you already own! 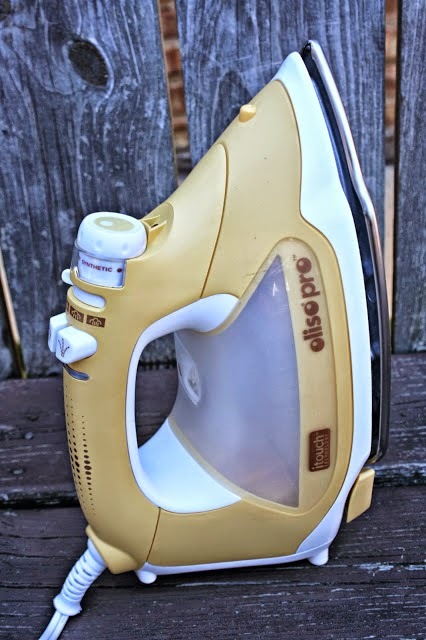 If you are looking for a new iron, Sara from Sew Sweetness did a great review of irons on Sew Mama Sew! Personally, I have an Oliso that was gifted to me and I do LOVE it! When you are ready to sew, I highly recommend you choose a simple a project to sew. Sitting down at a machine and sewing lines is fun for about three seconds before it turns boring. I think a patchwork quilt is the best way to learn how to sew. It teaches basic cutting skills ( unless you decide to just start with some charm packs) straight line sewing and matching up seams. It does not take a long time to finish a good sized lap quilt and patchwork quits look really great made in ANY fabric! There are thousands of absolutely FREE tutorials online for very simple sewing projects for beginners to try their hand at sewing. Feel free to use any of my free tutorials all located on my side bar. Jenny Doan from Missouri Star Quilt Company has free tutorial videos that are amazing and great for beginning sewing. Kimberly from Fat Quarter Shop also has some fun easy beginner projects on Youtube! Moda Bake Shop has new FREE pattern all of the time! 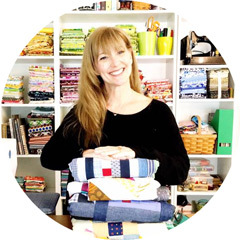 Heather Valentine at The Sewing Loft not only offers free tutorials but has a massive collection of links to other free sewing patterns too! Check out my Pinterest boards to get some ideas! The library has wonderful books filled with projects to sew. I like Elizabeth Hartman's Practical Guide to Patchwork and have found it at my local library. I had fun putting this list together and being able to look at what I do use and love to create. I would love to hear what item you cannot live without in your sewing room! I would add that people should start with 100% cotton fabric and consider taking an intro to quilting class - the videos only get you so far when you run into a snag and don't understand what you are doing wrong. Also avoid using sheets as quilt backs unless they are very loose weave. Cutting up shirts from thrift stores is also a cheap way to get fabric to start with. I love aurifil but it's not cheap. Also that irons around $200 - a basic model with good steam will get you started. I get my cutting mats at our local art shop for about 1/4 of the price of the quilting ones. I've come to the conclusion that manufacturers think that whacking 'quilting' in front of an item's description means it should command top dollar, rather like the word 'wedding' does with things! Great article! I just started sewing & quilting last year, and I knew some of this stuff but had gaps in my knowledge. Thoug I have to say, I started out with plain fabric and quickly realized I like prints more! Printed fabric hides my mistakes better!